When you program PHP code for MySQL connection you obviously need to know the schema of your MySQL tables. Nothing can be more annoying than having to leave your PHP IDE and run another program just to see your tables. Luckily with PhpED's Database Connection client you don't have to. In this tutorial you will learn how you can connect to MySQL database, browse MySQL records and manipulate them directly from PHP IDE. In this tutorial you will learn how to use DB Connection client to easily go from PHP to MySQL. 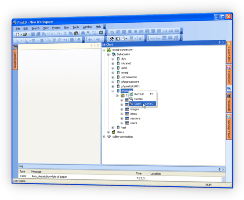 This illustration shows NuSphere DB Connection Client. PhpED's DB Connection client is a must have for development of any PHP MySQL applications. 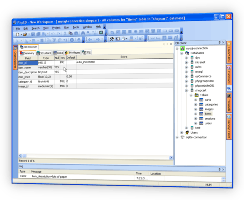 DB Connection client is used to setup MySQL or other database account. Click Tools -> Accounts on the menu bar or right-click on Accounts in DB Connection pop-up menu. 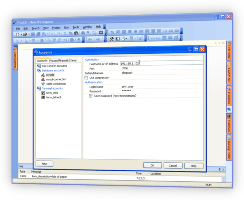 In the Accounts dialog press New and select MySQL or right-click on Database accounts, choose New > MySQL as shown on the following illustration. Print the account name and press Enter. Enter a Hostname or IP address for of the MySQL database, and enter the appropriate Port for the account (the default is 3306). In the Initial Database field, enter the name of your MySQL database. Enter Authentication options: Login Name and Password for your MySQL database. Select the Save Password check box if you do not want to enter the password whenever you access the database. For Example, the following illustration shows how you can setup MySQL database connection account to MySQL database running on host with IP 192.168.1.102, with initial database set to "shopcart" and login as "priv_user". Using right mouse button bring up a pop-up menu and select Copy. Look at this illustration that shows how to select and copy the name of the database "shopcart"
Once MySQL account is setup in DB Connection Client, you can use this account to build PHP MySQL connection using DB-Form Wizard. You can generate PHP code for PHP Forms submitting and updating records in MySQL and other databases. You can learn more about it in this DB-Form Wizard tutorial. In this tutorial you learned about the many features of the PHP DB-Connection Client and how to use them to quickly generate PHP code working with MySQL database. Additional technical information is available from the NuSphere Forum. Download a free trial of our PHP DB Connection Client today!